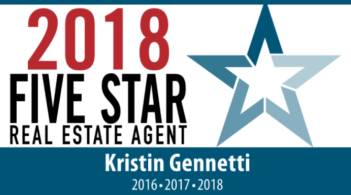 I had the pleasure of first working with Kristin Gennetti over four years ago while looking to purchase my first condominium. Kristin was truly exceptional and I’m so lucky to have found her. Kristin helped me through an extremely frustrating and stressful time with the seller of a property. She worked relentlessly for months when most people would have given up. Although the sale never went through, I was thrilled with how amazing Kristin was throughout a grueling process.I had no doubt I wanted Kristin by my side when I decided to enter the market again. A few months ago I decided it was time to buy my first single family home. I immediately contacted Kristin and was so excited to have the opportunity to work with her again. Kristin continues to impress me with her knowledge,dedication, and patience. If I ever needed anything she was a phone call of email away no matter what day or time. She truly cares for her clients and this purchase was so easy and stress free with Kristin on the job. I would highly recommend Kristin and can’t thank her enough for all that she has done. Thank you Kristin! You truly are the best.